Abstract: The Scythe Mugen 4 heatsink weighs 625grams and stands 157mm tall. 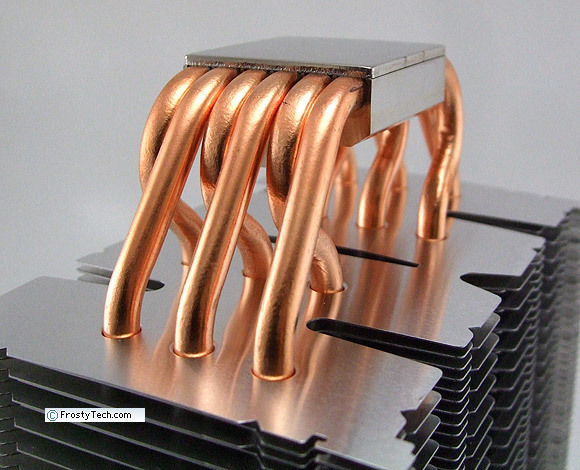 The heatsink is built around six 6mm diameter copper heatpipes and has a footprint of 130x112mm. 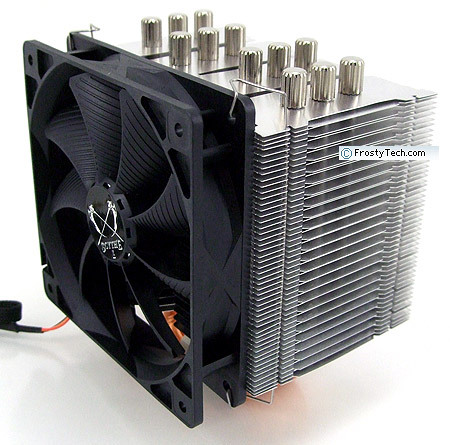 A 120mm PWM fan ships with the Mugen 4 heatsink, it rotates at 1400-600RPM and produces upwards of 41.9d dBA. The incandescent light bulb costs what, 60-cents? A compact fluorescent bulb is north of $6 apiece and LED bulbs are in the $20's. Computer heatsinks seem to be headed down the same path - not legislated obsolescence mind you - the flurry of $100+ all-in-one liquid CPU coolers appear to be replacing relatively affordable solid-metal heatsinks. Pity, I like compact heatsinks that perform exceptionally well. There's a challenge to that. 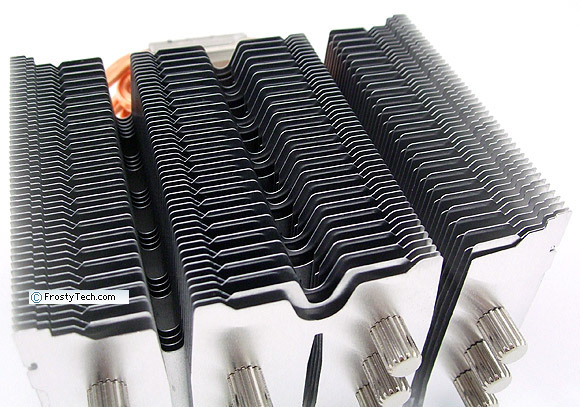 In this review Frostytech is checking out an aluminum and copper heatpipe heatsink from the Japanese firm, Scythe. Scythe generally produce lower noise heatsinks and have a propensity to experiment with form and fin geometries between each generation. In other words, Scythe continually evolve their heatsink designs. The Scythe Mugen 4 heatsink weighs 625grams and stands 157mm tall. 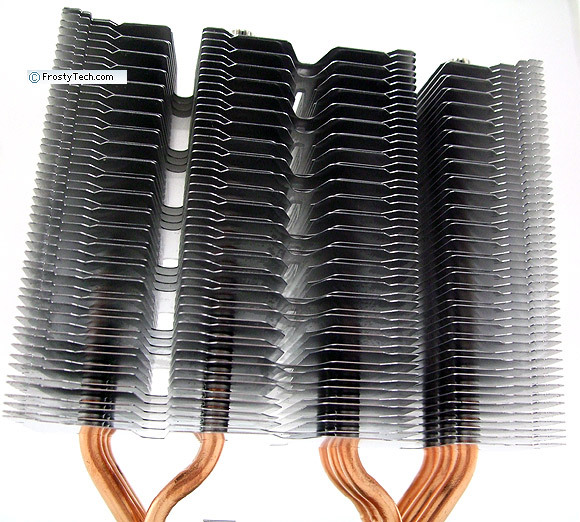 The heatsink is built around six 6mm diameter copper heatpipes and has a footprint of 130x112mm. A 120mm PWM fan ships with the Mugen 4 heatsink that rotates at 1400-600RPM and produces upwards of 41.9d dBA according to Frostytech's real world sound measurements. 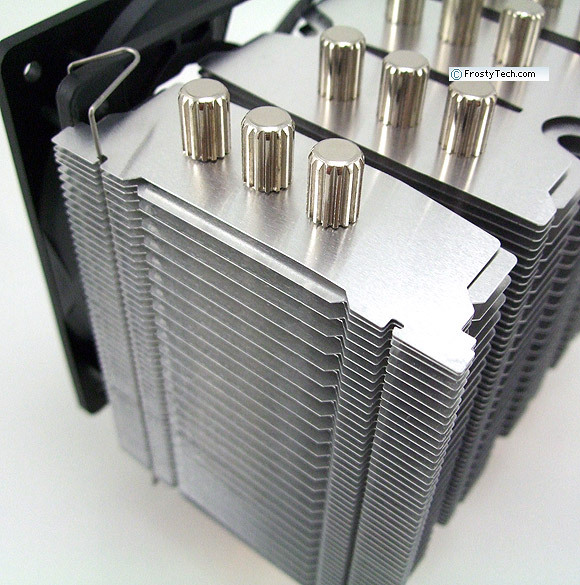 The Mugen 4 heatsink is compatible Intel socket LGA2011/1366/115x/775 and AMD socket FM1/FM2/AM2/AM3 processors. Retail price is estimated to be around $38CDN ($38USD). The Scythe Mugen 4 heatsink is designed around six 6mm diameter copper heatpipes (wick structure undisclosed) and a devilishly complicated aluminum fin stack. Where traditionally the fin stack was a monolithic block of punched out aluminum sheet metal, skewered onto the heatpipes and crimped in place, Scythe have adopted a three dimensional approach. The aluminum fins on the Mugen 4 contain horizontal and vertical voids, passages, alternating fin lengths/spacing, basically everything but surface dimples. How this fin design impacts thermal performance is difficult to say, but if it's aim is to reduce back pressure and thus drop fan pressure so noise is lowered, Scythe seems to be getting the job done. A single fan is supplied with the Mugen 4 heatsink, but an additional 120mm unit can be installed onto the back of the aluminum fin tower if desired as extra fan clips are supplied. To ensure good thermal conductivity between the nickel plated copper heatspreader and heatpipes, the two components are soldered together. 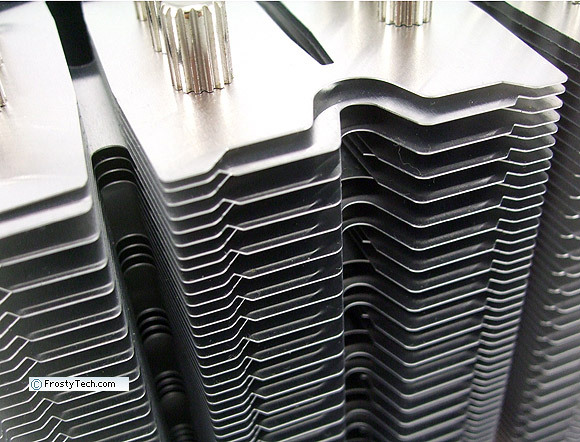 Throughout the rest of the cooling fins, the heatpipes are simply swaged into place. Scythe's Mugen 4 heatsink is compatible with Intel socket LGA2011/1366/115x/775 and AMD socket FM1/FM2/AM2/AM3 processors. 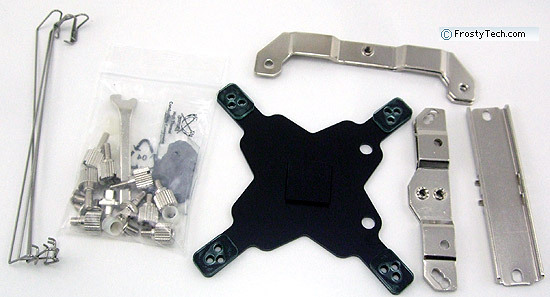 The CPU cooler ships with a variety of brackets for AMD and Intel processor families. For each CPU socket, small metal tabs are attached to the base of the heatsink or screwed directly to the motherboard. The multi-language manual makes installation straightforward.